Mashed sweet potatoes topped with sautéed kale, roasted chick peas and crispy bacon! Let’s talk about layers. Flavor layers. Texture layers. Bacon layers. 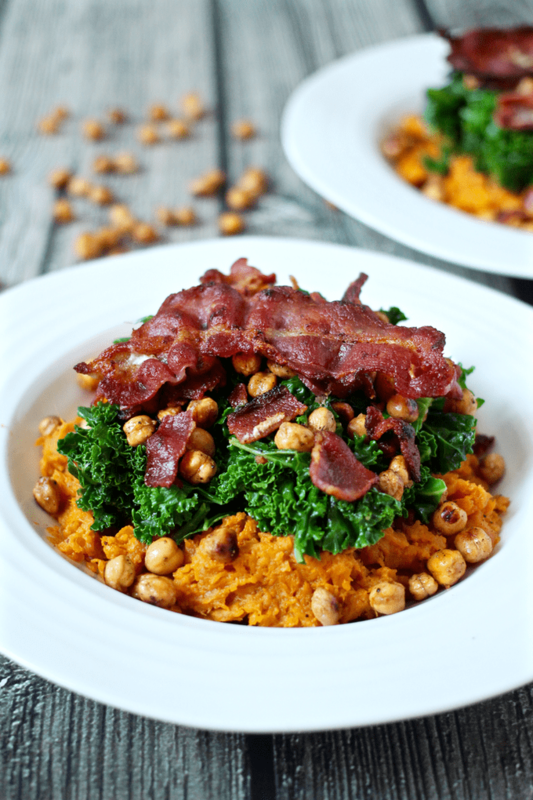 These sweet potato bowls have it all going on. 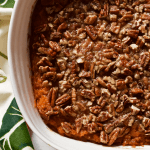 Sweet, fluffy mashed sweet potatoes. 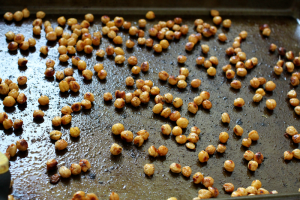 Crispy, cajun-seasoned roasted chick peas. Tender sautéed kale. All layered and topped off with crispy crumbled bacon. Hello, happy dinner! 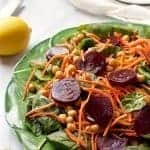 You could certainly skip the bacon and have this be a delicious vegetarian meal. 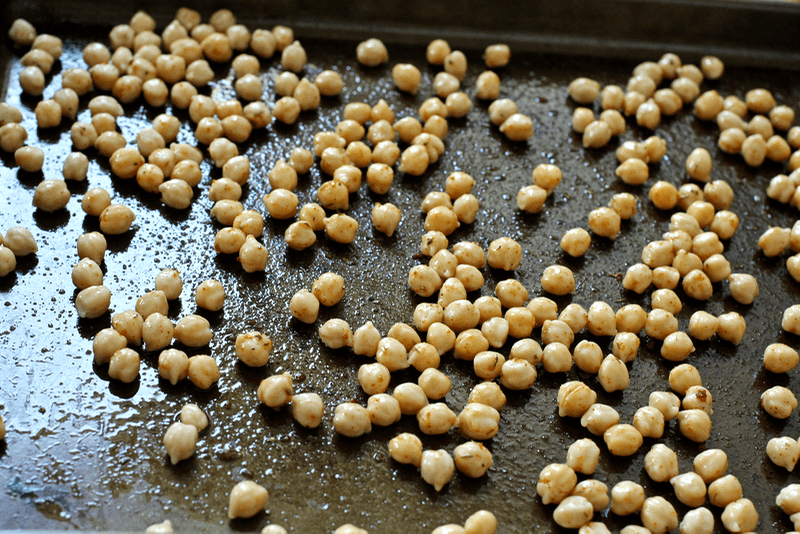 You’ll get plenty of protein from the chick peas. (Which make an excellent snack all on their own, if you’ve never tried them seasoned and roasted like this. 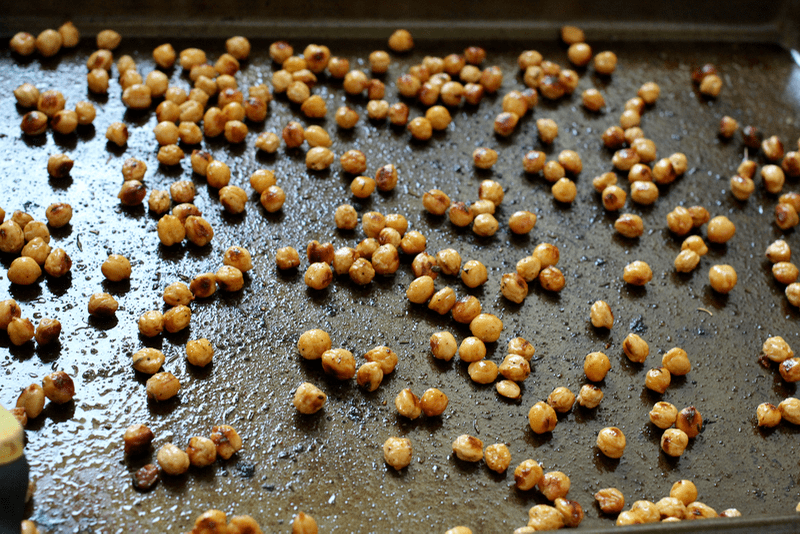 Very crunchy and pop-able – and very addictive!) 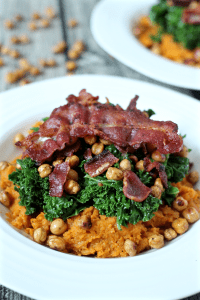 I sometimes serve these sweet potato bowls for our meatless Monday dinner, even though it isn’t really meatless. But if you aren’t vegetarian, I highly recommend the bacon. It’s still a very healthy dinner. And let’s face it, bacon makes things taste better! I also love how very, very budget-friendly this dinner is. Basic ingredients made into a delicious, well-rounded meal. 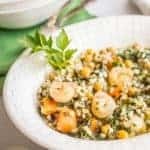 Each part of the meal gets a little love on its own and then they all come together for a yummy, wholesome dinner bowl. I particularly like being able to get a little bit of everything all in one bite. Hope you love these sweet potato bowls as much as we do! 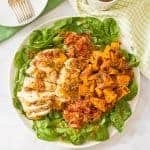 Wash sweet potatoes, poke with a fork and place on a foil-lined baking sheet. Bake at 400 for an hour to an hour and a half, until tender. 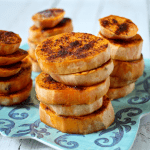 Once cool enough to handle, remove potato skin and put sweet potato in a bowl. Mash with a fork and season with salt and pepper. 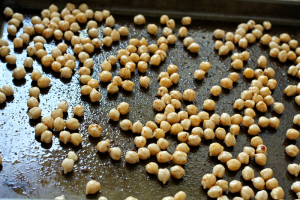 Meanwhile, toss the chick peas with olive oil and cajun seasoning. Roast at 400 for 30 minutes. (I stick them in when the sweet potatoes have about 20 minutes left, so they’re ready to go once the sweet potatoes are cooked and mashed). 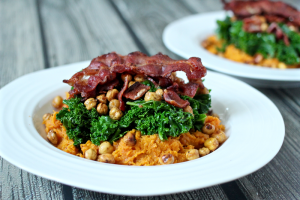 While the sweet potatoes and chick peas are roasting, cook your bacon. I do mine in the skillet on the stove over medium heat until crispy on both sides. 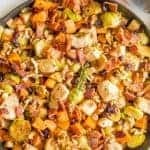 I don’t use any oil or butter because the bacon releases so much of its own fat and grease. Once cooked, remove to a paper towel to absorb the extra oil. In the same skillet, use the bacon grease to cook the kale. Put the torn kale leaves in the skillet and cook, stirring occasionally, until tender and slightly wilted, about 5-6 minutes. Season with a little salt and pepper. To assemble the bowls, place the mashed potatoes in the bottom, top with kale and crispy chick peas and crumble the bacon over the top. I do a piece and a half of bacon for each person. Grab your fork and dive in!